Kittywalk Grand Prix: 86" x 70" x 5"
* The Grand Prix combines our most versatile components: one Penthouse, 2 Sets Of 4 Curves and one T-Connect. * This award winning circular system allows your indoor cat to safely navigate the great outdoors. * Up, down, around and around and around. * Your cats will never get enough. * Designed to allow your cats the ability to run uninterrupted to their hearts content without having to stop at the end of the enclosure, turn around then run off again. 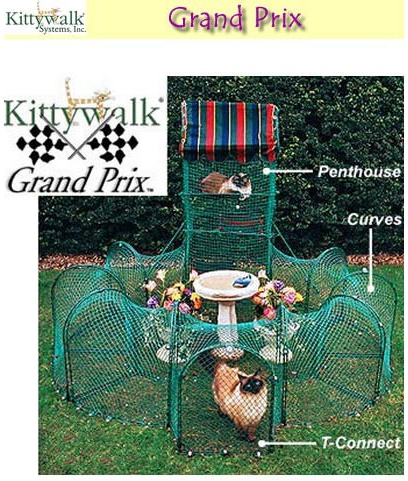 The Kittywalk Grand Prix is great for either one cat or can comfortably accommodate two to three cats happily together at the same time. * Like all Kittywalk enclosures, the Grand Prix can be moved from place to place without harming the landscape.